Lady Viks Finish District Play 7-5, Advance To Playoffs. The Lady Viking basketball team finished off the season last night with a 53-40 victory over McCallum. The Viks picked up their 7th District win and 16th win of the season and will make the playoffs for the second season in a row. The Viks were led by Senior Kadasia Duirden and Junior Erica Coleman. Duirden closed out her regular season high school career with a stellar performance scoring 17 points and snatching 12 rebounds. Coleman also finished very strong posting an impressive stat line of 15 points, 9 rebounds, and 4 blocks. Player of the game however went to Senior Bonnie "Buckets" Torres who played with incredible hustle and scored 6 points late in the game to help seal the win. Evelyn Castro and Carol Rodriguez rounded out the scoring effort with 11 points and 4 points respectively. Keep an eye out for details regarding the upcoming bi-district playoff game which will take place on February 12th or 13th depending on seeding. 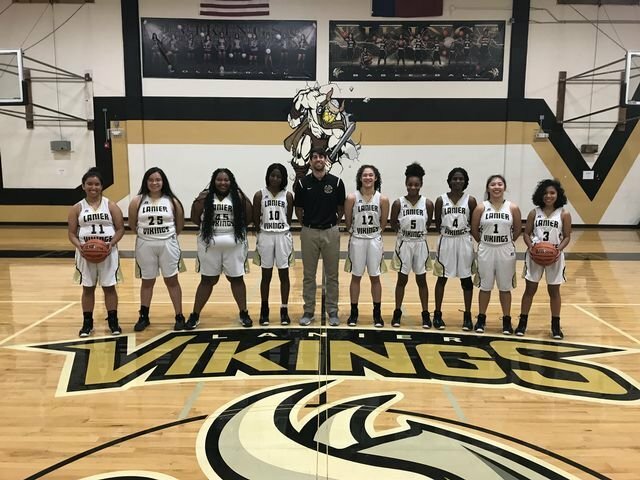 The Lady Viking basketball team picked up another win this past Friday beating the Travis Rebels 47-44. After a slow first half, E'jhana King and Kadasia Duirden provided the senior leadership the Viks needed to pull out the win. E'jhana stepped up when needed most with 23 points, 17 Rebounds and 7 Steals and Kadasia controlled the tempo of the game on both ends and had 13 points. Carol Rodriguez locked down the Rebels 6ft tall post player in the second half which started the third quarter run that allowed the Viks to take control of the game. Jasmine Riley provided 9 points and Bonnie Torres knocked in one of her classic mid-range jumpers for 2 points. The Viks are now 6-4 in district and hope to improve on that record in the upcoming final week of district play. The Vikings final home game will be this Tuesday against Crockett High School. Tip off will be at 8pm. The Lady Viks moved up to 5-2 in district play after last nights senior night win, beating Reagan 59-14. All five seniors came to play last night and commanded the win from the first tip to the last whistle. Lady Viking player of the game Kadasia Duirden stole the show with 15 points, 7 assists, and 10 steals. E'jhana King also had a dominate performance with 20 points, 15 rebounds, and 7 steals. And Erica Coleman posted an easy 13 points, 4 assists, and 4 steals. 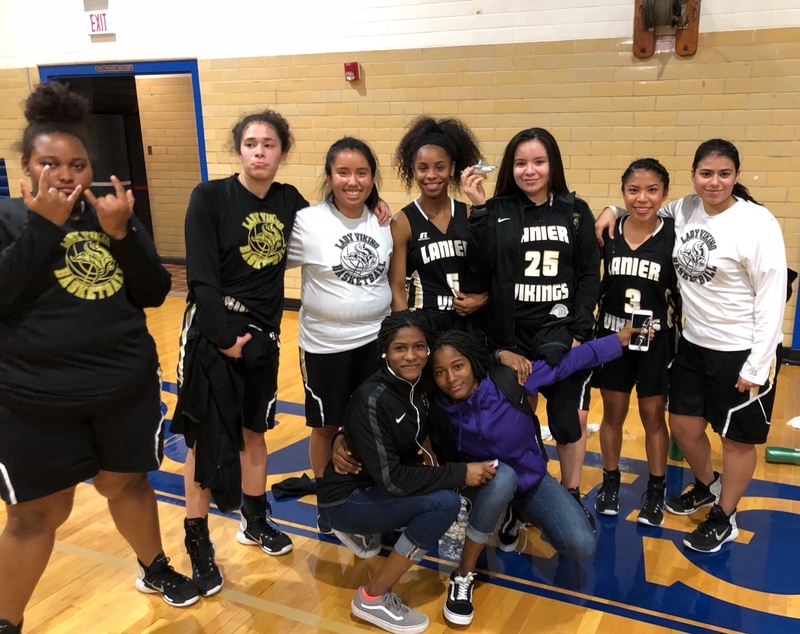 The Lady Viking scoring effort was rounded out by Evelyn Castro (5 pts), Carol Rodriguez (2 pts), Bonnie Torres (2 pts), and Jasmine Riley (2 pts). The Viks face off with LBJ high school this Friday. Games tip off at LBJ at 6:30 and 8:00pm. The Lady Viking basketball team took down Ann Richards in a non-conference game this past Friday 70-27. Ann Richards had no answer for the two double-doubles posted by Erica Coleman (29 points, 10 Assists) and E'Jhana King (16 points, 16 Rebounds). As if this duo wasn't enough Kadasia Duirden also chipped in double digit scoring with 10 points. Jasmine Riley (6 points), Carol Rodriguez (4 point), June McShan (3 points), and Bonnie Torres (2 points) rounded out the scoring effort. The Lady Vikings recent adoption of the spirit animal of Shark may be a contributing factor in the recent tantalizing play. Shark of the game was awarded to Jasmine Riley for her unmatched enthusiasm and hunger in the game. The Vikings hope to bring the same energy this Tuesday when they face off with Reagan at home for senior night. Tip off is at 7pm. The Lady Vikings took down the McCallum Knights Tuesday night 45-29. The Viks got out to a fast start going up 13 to 3 after the first quarter of play. Foul trouble helped the Knights get back in the game and after the third quarter the Knights had brought the game within 5 points. The Viks played a dominant 4th quarter and the defensive efforts of sophomore guard Evelyn Castro helped to hold McCallum to just 1 point for the final period. Erica Coleman was a dominate force once again scoring 21 points and snatching 10 rebounds. The scoring effort was rounded out by E’jhana King (11pts), Jasmine Riley (9pts) and Kadasia Duirden (4pts). The Viks have now finished the first half of district play with a record of 4-2 and are now in 3rd place in the conference. The Lady Viks play Friday at 7pm at Ann Richards High School. The Viks fell to Crockett this past Friday 39-52. After having a strong start and going up early in the first quarter the Viks couldn’t find enough baskets to get by the Cougars. Erica Coleman led Lanier with 18 points, 6 Rebounds and 2 Blocks. E’jhana King was good for 8 points and 11 rebounds. Kadasia Duirden chipped in 4 points and snagged 9 rebounds and Jasmine Riley continued to expand her role in the offense with 9 points. The rematch between the two schools promises to be a battle when the Cougars visit the Viking Ship on January 30th. In the meantime the Viks face off with McCallum at home this Tuesday at 8pm. Hope to see you at the game. Last night the Lady Viks collected their 11th win of the season defeating the Travis Rebels 64-34. E’jhana King was a dominant force in the game filling up the box score with 15 points, 9 rebounds, 10 assists, and 8 steals. Erica Coleman continued to fill up the basket as she has done all season, leading the Viks scoring effort with 22 points. Evelyn Castro and Jasmine Riley also both had big nights. Castro went for 12 points while Riley went for 6 points, 6 rebounds and 7 steals. Kadasia Duirden (6), and Lisbeth Ponce (3) rounded out the scoring effort. The Viks will face off with Crockett High School this Friday night at 8pm at Crockett. Come out and show your support. In case you hadn't heard the Lady Viks beat LBJ last night 62 to 57 Tuesday making them 2-0 so far in district play. The win was one for the history books as LBJ has been a dominant force in District 26-5A in the past few decades. The Viks poured their hearts and souls into team defense and hustle to upset the Jaguars. The three captains for Lanier again filled up the box score. E'jhana King posted 18 points 7 steals, 9 rebounds. Erica Coleman had 16 points, 7 steals, 6 rebounds. Kadasia Duirden put up 14 points, 6 rebounds, and 4 steals. 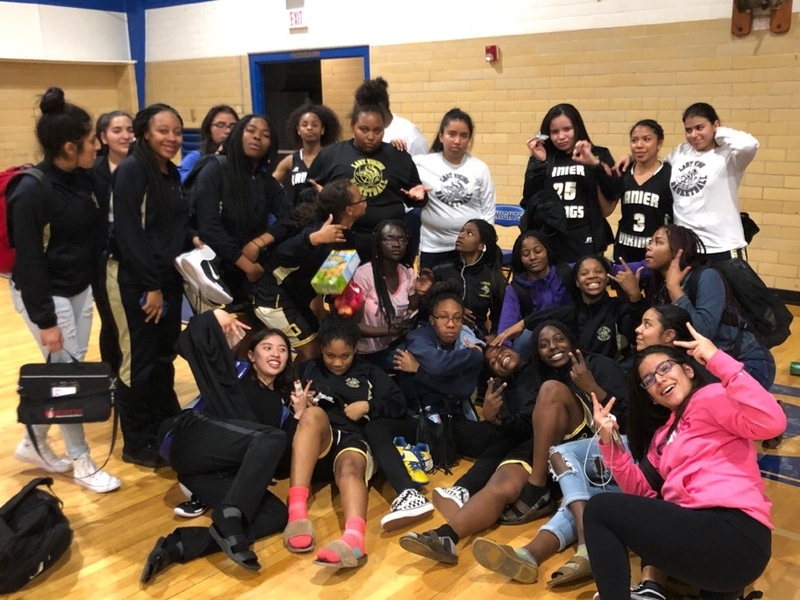 The scoring effort was rounded out by Evelyn Castro (3 points), De'hja King (4 points), Jasmine Riley (4 points), Carol Rodriguez (3 points). The Viks play at Austin High next Tuesday, Freshmen 5:30, JV 5:30 and Varsity 7:00. Come out and be apart of the ride. The Lady Viks matched up Saturday with the Reagan Raiders after a Friday snow-day reschedule. The Viking's intense defense forced 37 turnovers on the night and set the tone for the game allowing the Viks to cruise by the Raiders, winning 63-16. The three captains for Lanier all stepped up and had big games. Junior, Erica Coleman exploded for an impressive 37 points, 9 steals, and 5 rebounds in only 23 minutes of play. Senior E'jhana King was just shy of a triple-double scoring 10 points, collecting 13 rebounds and tracking down 7 steals. Senior, Kadasia Duirden chipped in 8 points, 6 rebounds and 4 steals. Jasmine Riley(4 points), Bonnie Torres(2 points), and Carol Rodriguez(2 points), rounded out the scoring effort for the Viks. Come out and support the Lady Viks this Tuesday as they face off with LBJ High School for their district home-opener. Freshmen play at 5:30, JV at 6:30 and Varsity at 8:00.